Name: "Christ's Monogram Page, Book of Kells"
For analysis and explanation of other important pictures from the Renaissance, see: Famous Paintings Analyzed (1250-1800). One of the most sublime examples of medieval painting ever seen, the Monogram Chi/Rho page is the most important page in the late 8th-century Book of Kells, arguably the finest of all illuminated manuscripts of the Middle Ages and famous for the intricate swirling patterns of its Celtic art. The book was created about 800 by Irish monks in the monastery of Iona, off the western coast of Scotland. The monastery was founded by Saint Columba in 563, and quickly became a centre of Irish monastic art and culture. (See also: Cathach of St. Columba, 610-20; and the Book of Durrow, 650-80.) Following a particularly savage Viking attack in 806, the Iona monks, together with their collection of early Christian art, moved to the Abbey of Kells, County Meath, Ireland. The Book of Kells remained here until 1007, when it was stolen. Its ornamentation - a typical example of Celtic metalwork art - included a gold cover encrusted with precious stones. But these were torn off when the book was stolen and the rest thrown in a ditch, from where it was recovered and returned to the Abbey. The miniature painting which fills the Monogram page, is almost entirely devoted to the two Greek letters Chi and Rho (the first two letters of the Greek word for Christ) which together form Christ's monogram. Dominated by complex Celtic designs - featuring Celtic interlace and Celtic Spirals, as well as Celtic Knots, key patterns and zoomorphic images - whose intricacy is astounding, the page also features several well-hidden figurative images. These include three angels, as well as two mice eating a communion wafer. Colour pigments used in the Monogram page and other folios in the Book of Kells, include yellow and red ochre, indigo, green copper, and the extremely rare lapis lazuli which was imported from mines in Afghanistan. See also: Making of Illuminated Manuscripts (c.700-1200). Like Chinese calligraphy - which is at the same time poetry, painting, and many other things besides - the qualities of Celtic style abstract decoration go way beyond its decorative function. This is especially the case when the work in question is the Book of Kells, unanimously hailed as the highpoint of "Insular" illumination and one of the key works of Medieval Christian art (c.600-1200). Simultaneously concealing and revealing, hiding and displaying, the extraordinarily luxuriant ornamentation of the Monogram page is not simply a masterpiece of medieval art: it is, at once a work, an object, and a mysterious path, with its connotations of magic and revelation. Its visible forms are not just "something written" and then embellished; they show the Word, the divine Word, which must be hidden in order to remain Truth, as if in a tabernacle. 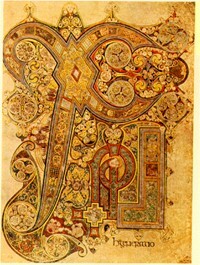 In the twelfth century, an erudite churchman and chronicler, Giraldus Cambrensis, said of the Book of Kells: "Look at it closely and you penetrate into the greatest secrets of art, you will find there ornaments of such complexity, such a wealth of interlace knots and lines that you would think it the work of an angel rather than that of a human being." (Topographia Hiberniae, 1188). The Book of Kells contains the four Gospels of Matthew, Mark, Luke, and John, in Latin, as well as lists of Hebrew names, and the Eusebian canons. It is written on vellum and its illuminations are thought to be the result of up to three different artists. Such an exquisitely decorated Gospel book would have been treated as an object of veneration, and would have been brought out only on special feast days and festivals. It remained at the Abbey of Kells until 1541, when it was taken away for safekeeping (during Henry VIII's Dissolution of the Monasteries) by the Roman Catholic Church. Repatriated to Ireland in 1661, it was donated to the Trinity College Dublin, where it is now conserved. See also: History of Illuminated Manuscripts (c.700-1200). NOTE: Other famous Christian manuscripts illustrated with Celtic-style designs include: the Lindisfarne Gospels (c.698), the Echternach Gospels (c.700), and the Lichfield Gospels (730). World's oldest surviving gospel texts in the Abba Garima monastery. Romanesque, Gothic and International Gothic book painting. Medieval illustrated Gospel texts: St Albans Psalter, Winchester Bible. Book painting, Medieval illuminations, books of hours, psalters.  For the meaning and interpretation of other manuscript illuminations, see: Homepage.